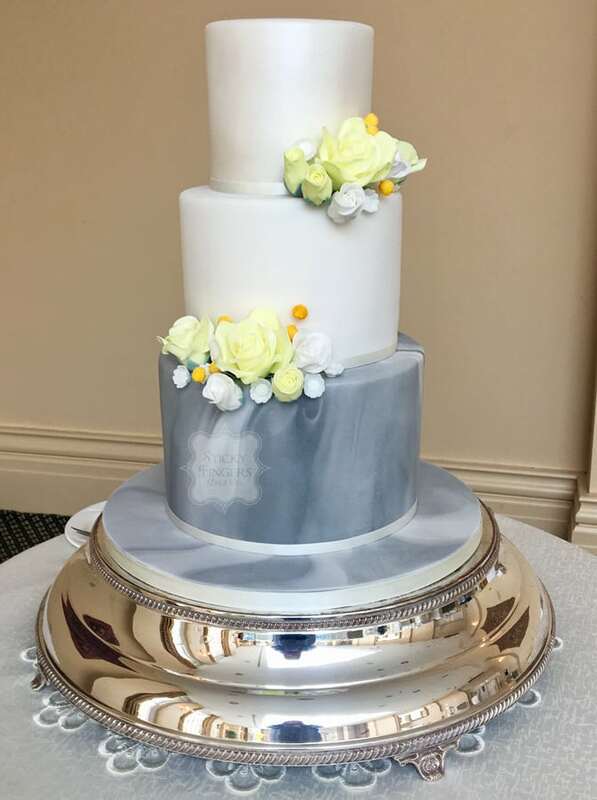 I was really looking forward to creating Jo and Martin’s wedding cake for The Lawn, Rochford on 11th April; apart from the fact that their colour scheme of lemon and grey is bang on trend at the moment, the groom is also a massive West Ham United fan (the best team in the country of course!) and although their colour scheme wasn’t claret and blue there were lots of lovely subtle references to his team. Let’s start with the bottom tier of their wedding cake.. Jo had asked me on the QT to bake a claret and blue sponge so that when they cut the cake Martin would have a great surprise, so the bottom tier was a red velvet sponge (for the claret) and a vanilla sponge with blue food colouring. Covered in a grey marble icing Martin didn’t have a clue! I wish I could’ve been a fly on the wall when they cut the cake just so I could see his reaction! Hopefully their photographer was able to capture the moment perfectly. The other yummy flavours were lemon limoncello for the middle tier and strawberry & champagne for the top tier. The sugar flowers matched some of the flowers used in the table decorations and Jo’s wedding bouquet. The table plan was amazing! Being a West Ham fan myself I was able to appreciate each table name they had chosen – players from the 60’s 70’s and 80’s, Trevor Brooking being my hero! The huge bright yellow balloons by Love Me Do Balloons – on Instagram @lovemedoballoons. Funnily enough we all worked together last year on Louise and Will Peck’s wedding at Houchins, Coggeshall so it was great to see them both again. Finally, as favours for their guests the happy couple gave them all little pots of honey with personalised drizzler spoons, I thought they were amazing. In fact, every single detail of their wedding was thought out perfectly. Loved this wedding so much! Congratulations guys and up the Hammers!